Hello! 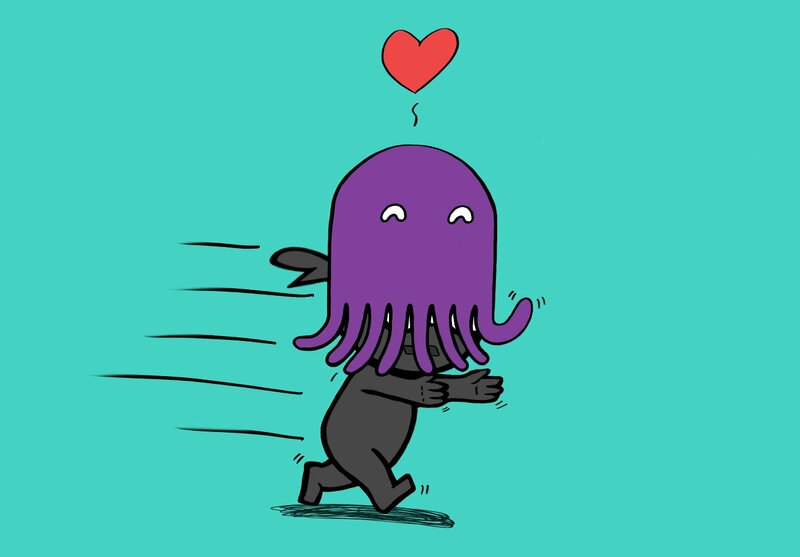 The Ninja Forms team is seriously excited about our newest integration with one of the neatest email marketing solutions out there: EmailOctopus! If you’re a WordPress user, this partnership has some huge implications for how you manage your marketing efforts. If you’re not familiar with Ninja Forms already, you may not realise yet just what this pairing brings you. We’d like to fix that by introducing Ninja Forms to the EmailOctopus family. We are the most modern, painless, and friendly WordPress form builder out there. Put us together with EmailOctopus and you’re going to become the email marketing rockstar of your company’s team. Let us show you how! What does Ninja Forms + EmailOctopus offer me? Want to expand the user experience when someone new subscribes? Offer an incentive for new sign ups? Craft a personalized thank you? Control form spam? Now you can. Ninja Forms puts dozens of possible after-submission actions at your disposal. Here’s a taste of a few of the most popular. Want to shoot a confirmation email out to the user after signup? Want a notification after someone clicks subscribe? Offer incentive in the form of lead magnets/PDFS/etc? Deliver with Ninja Forms! Unlimited email actions let you craft personalized messages to both your team and new subscribers. Add attachments from your WordPress Media Library. Include form data in the email. Customize the email completely to fit your needs. Use the Success Message action to craft a custom thank you for every subscriber. Ask them their name in the form? Use the merge tag functionality to thank them by name. Prefer a video message thank you? Attach it to the Success message. You have a full rich text editor at your disposal for these, so get creative! Prefer to send them to another page you’ve designed for this purpose? You can do that too via the Redirect action. It’s even easy to pass data between pages if needed! Your subscriber info is obviously going to your EmailOctopus list, but you now have an extra layer of submission management and control. First, want to limit who can submit your form? Accept a form submission from an individual only once? Unique field functionality allows this effortlessly. You can also limit the number of times a form is submitted. As mentioned above you can have submission data emailed to yourself, and you also have a full record of every submission available to view or download in your WordPress dashboard. Are you a data junky? Use Google Analytics? Set us up to send Event Tracking data every time a submission completes. We also have a variety of ways to help you stop form spam dead in its tracks. Your website’s aesthetic has been carefully chosen for its visual appeal and representation of your brand. Your forms will blend flawlessly with that aspect of your site on any theme designed to meet WordPress standards. Beyond that, you now have the power to fine tune every visual facet of your form. Want to keep your subscription form in a widget? No problem. 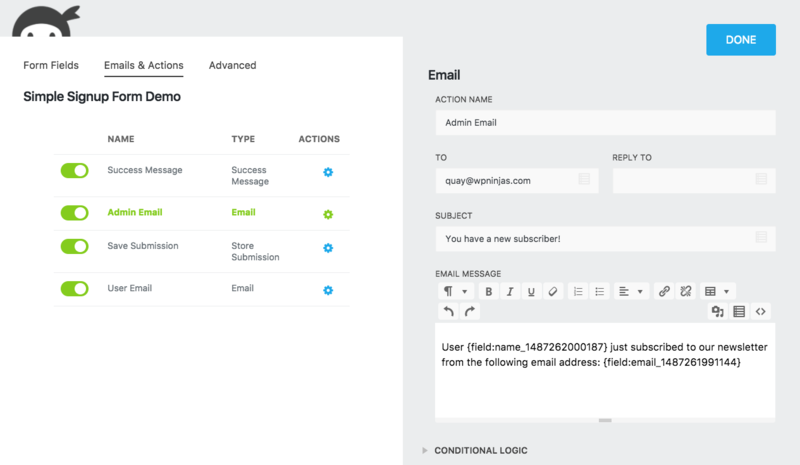 We’ll pop seamlessly into the sidebar or widget where your current EmailOctopus form lives. In the body of text on a page maybe? Sure. Whether by widget, our append-a-form box, or shortcode, you can put us anywhere. Even in a popup! Bored with the normal, lifeless, vertical layout of most subscription forms? Get some style! It’s super easy for you to design row/column layouts for your form like a pro. Easily add images to your form to give them some extra attention-grabbing spice. Everything we’ve mentioned above is a part of the free Ninja Forms builder. For around 90% of our users, that’s all they ever need. The same most likely holds true for our extended EmailOctopus family now, too. Some of you though, you need more. Need to send subscribers to different lists from the same form based on how they fill out your form? You can make that happen. Notify specific people or departments via email or text of a new lead based on what that lead inputs into the form? You can do that too. Need to make a longer form look less intimidating? No problem. Let a user save their progress as they move through a form? Sure. If you’re a power user or a budding marketer that needs more, be sure to drop in for a visit on ninjaforms.com to see what else you can do to take your marketing game to the next level! Again, we’re thrilled to become part of the extended EmailOctopus family and look forward to serving you however we are able. Our goal as a team is to make WordPress a little more accessible and a lot more user friendly for anyone and everyone who has need of a form. Combined with EmailOctopus, we’re excited to bring our philosophy of a modern, painless, friendly experience to each of our new cephalopod comrades. Please feel free to reach out to us anytime if you have any questions about how we can help you rock your email marketing game!